Why the name Moose Jaw? Moose Jaw began as a winter encampment for the Cree and Assiniboine Nations. The narrow crossing at the river and plentiful game made Moose Jaw an ideal place for an early settlement of fur traders. Warm breezes often flowed through the valley where the settlement lay. The Cree word Moosegaw means warm breezes and later the “g” was replaced with a “j” and Moose Jaw was born. The first homestead was established by James Hamilton Ross who arrived in Moose Jaw during dead of winter on January 2, 1882 to become the first permanent resident to settle there. Ross and the four others he was travelling with, including Hector Sutherland, were in search of the most likely spot for the Canadian Pacific Rail lines (CPR). 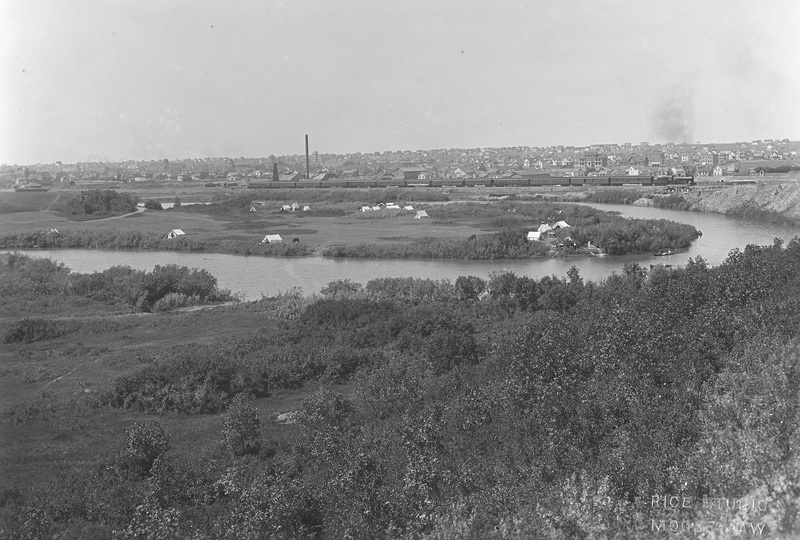 Choosing a site adjacent to the Moose Jaw River to ensure a water supply for their steam engines, almost 8,000 men and 2,000 horses flooded west from the Manitoba border to construct the CPR, reaching Moose Jaw in July, 1882. Once the end of the line was through Moose Jaw, the city’s population grew rapidly, and by the fall of that same year, there were stores, saloons and dozens of shacks and canvass tents. By May, 1883, the population of Moose Jaw fluctuated between 2,000 and 3,000. The settlement continued to grow rapidly and was incorporated into a city on November 20, 1903. Moose Jaw grew to prominence in Western Canada as it experienced a commercial and industrial boom. With rail lines going east, west and south, the city became a hub for industry, agriculture and commercial trade. By 1913, the population grew to 14,000. Moose Jaw’s unpredictable boom allowed the city to boast electricity, paved streets, and a street railway as early as 1914. Bootlegging, gambling and prostitution began to thrive, but these shady industries were literally kept underground in the basements of hotels and restaurants that were connected by underground tunnels. These tunnels were built from the former CP Rail Station on Manitoba Street to the Cornerstone Inn across the street where there was a secret above-ground entrance behind the Inn. The Moose Jaw Tunnels attraction. The network of Tunnels extended directly across Main Street to the former Exchange Cafe, once one of Saskatchewan's finest dining establishments. Other tunnels went north up Main Street and west along River Street to the Royal and Brunswick Hotels. The Roaring Twenties brought a measure of notoriety to the city, with "celebrities," like Al Capone and Morris “Two-Gun” Cohen, rumored to have stayed in downtown hotels. Today, Moose Jaw is home to over 30,000 people and is best known as a tourist destination with many attractions like the Tunnels of Moose Jaw, the Temple Garden Mineral Spa Resort, the Moose Jaw Trolley, the Western Development Museum, Casino Moose Jaw and the Murals of Moose Jaw. Every July, the Saskatchewan Festival of Words takes place over a four-day period showcasing top Canadian writers in a wide variety of genres. The Snowbirds flight demonstration team is based at Canadian Forces Base, south of Moose Jaw in Bushell Park. The city is no longer called a 'goddamn virus'. Instead, it is known as the friendly city.